Extensive use of wood over the ages for furniture and other products has challenged the environment more than ever before. The population of trees and forests is ever receding. This increasing need for wood has been beautifully supplemented by cane and bamboo. These eco-friendly products are light in weight and have their own style and elegance. These products have a high life with minimum maintenance and are at par with wood, if not better. 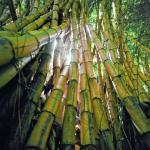 Strips of bamboo and various types of canes are extensively used to manufacture different utility and decorative items. Mats, lamp shades, trays, baskets are weaved and knitted by the skilled hands of the artisans. Cane and bamboo can also be converted into strong and unique furniture, which are very popular now. Jewelry, bags and handbags are the other popular items of this craft. The cane and bamboo craft exists in almost all the villages in the interior of Sikkim and the skilled artisans here offer a distinguished range of products.